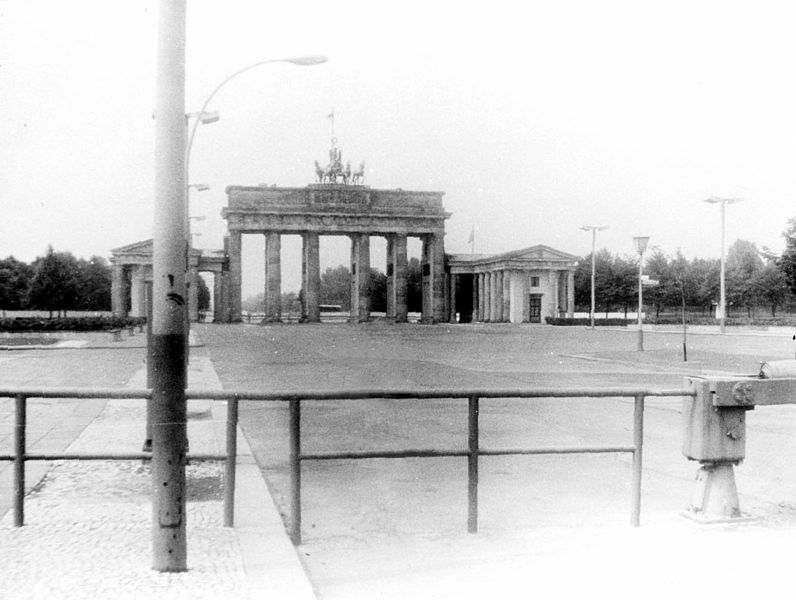 In March of 1989, I was a 19 year old student studying abroad who had the opportunity to go with my class behind the iron curtain for a day and visit East Berlin. To say it was life changing is a gross understatement. Here was a city divided in the most literal sense; where a wall sprang up within a week, dividing neighbor from neighbor, making thriving thoroughfares into dead-ends. It was a wall that anyone could touch without incident on one side, yet on the other to even approach within 100 yards meant near certain death. It was a city where a mere 200 yards meant the difference between total freedom and complete captivity. This wasn’t the movies, and it certainly wasn’t a joke. I saw with my own eyes the guards armed with machine guns patrolling the “death strip” and I felt in my soul the fear of the state that East Berlin residents lived with for 28 years and one day. I was transported back in time looking at dilapidated buildings still pock-marked with World War II bullet holes. I wandered down rows and rows of empty store shelves on floor after floor of one of the city’s largest department stores. I saw people afraid to make eye contact with a Western teenager under the gaze of the all-seeing eyes of security cameras. I held in my hand an essentially valueless currency. The resignation of a people from whom all hope had been systematically stripped was palpable and horrifying. In all, 125 people lost their lives trying to escape the oppression that was East Berlin. In fact, just weeks before I personally experienced the degradation of this once glorious city, two people about my age tried to breach that monstrous wall. One was fatally shot and the other was badly injured and later imprisoned. Their crime was yearning for freedoms I took for granted. The only difference between us was where we happened to be born. I vowed never to return to Berlin until that wall came down. And I was certain that I would not live to see that day. Yet fewer than 8 months later, on November 9th, 1989, I sat sobbing in front of the television in my dormitory basement as ecstatic East Berliners stood atop that wall and crossed freely into a West Berlin many had only dreamed of ever seeing. And in 1998, I returned to Berlin, blessedly not the city I remembered. And I sobbed again as I walked freely beneath the Brandenburg Gate where 9 years before I would have been shot for walking. So will I vote tomorrow? Yes, I will – reverently. While I vote, I intend to hold in my hand the small, graffittied piece of the Berlin Wall that a fellow student, with whom I travelled in March of 1989 and who returned soon after the wall’s fall, collected for me. And if I have to stand in line amidst what I hope will be the greatest turn-out in the history of this democratic republic, I will think about great moments in the history of freedom and reflect on what it means, the people who have died to attain it, and what a privilege I have been granted to have it.